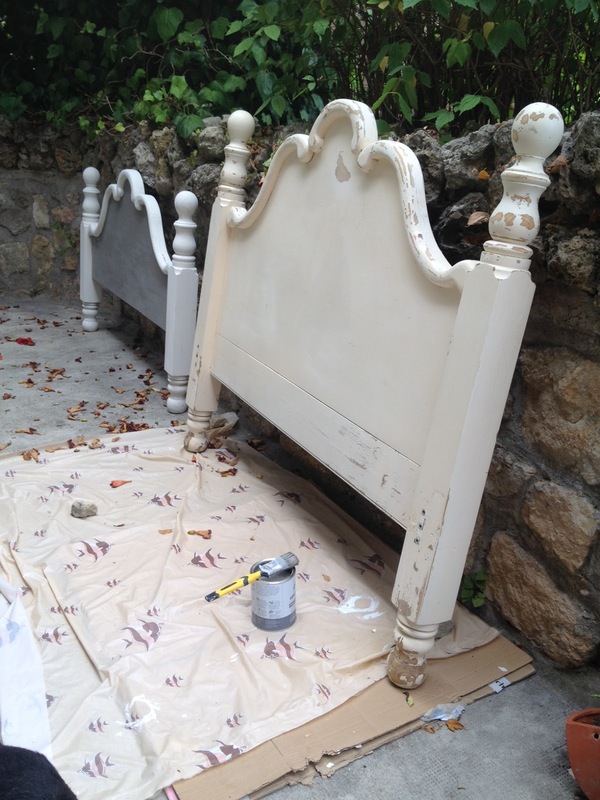 Having made a good start on Project Cabana (with everything now waiting for a second coat and having slightly hit the wall) it was time for a break… back to Project Studio and the painting of the bed! Everything now seems to be at the second coat stage. Time to finish some things off! As suddenly as it vanished, the internet suddenly reappeared without any warning. Suddenly we’re reconnected and back in business as it’s been extremely tedious trying to work remotely. Hurray, celebrations all round! 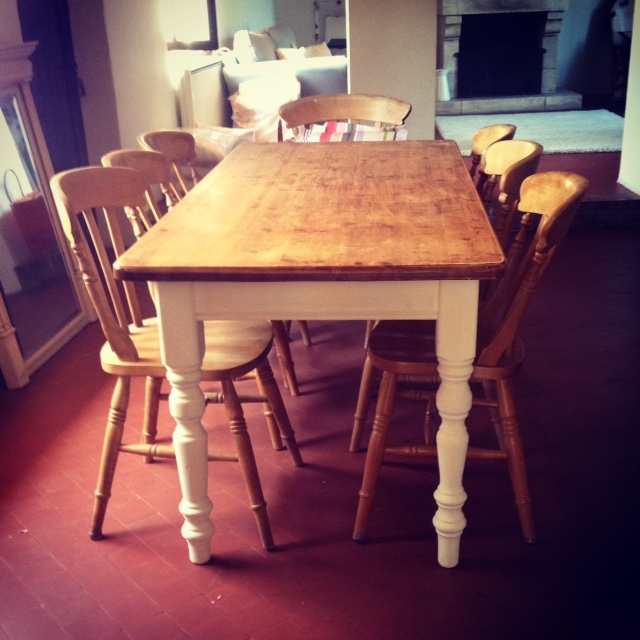 To celebrate, I painted the legs of the pine dining table cream. We’re not big fans of varnished pine and it must be said I have a low boredom threshold when it comes to painting and need a variety of projects on the go. 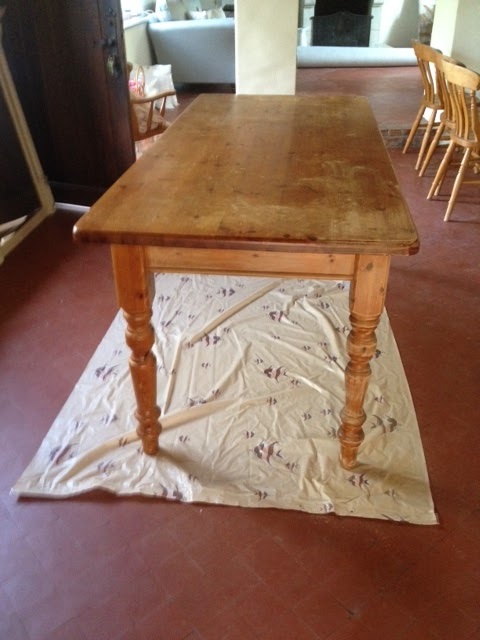 With a free table and a pot of paint, well, why not? On Wednesday I met a woman in a car park to do a deal. It was all very surreptitious … it could have been drugs but of course, it was homewares and handicrafts as it turned out she’s living the dream as she owns an old mill and upscales furniture. 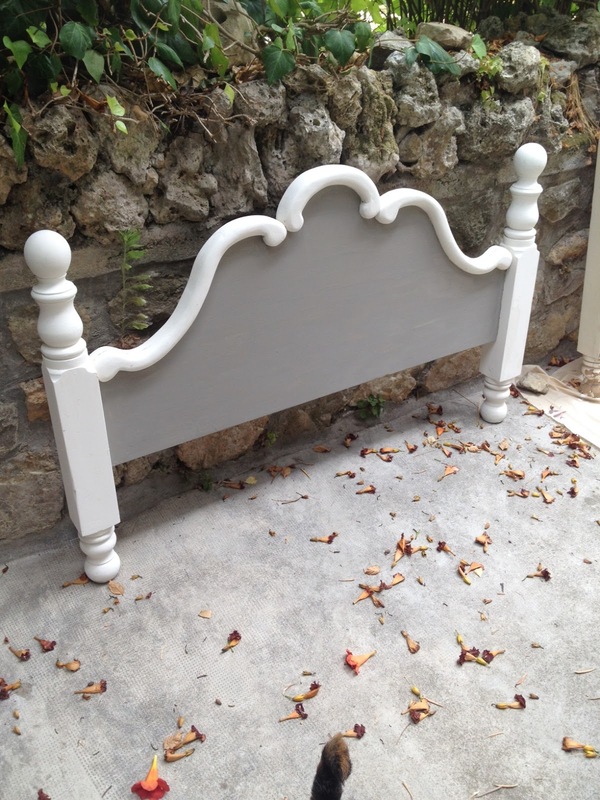 I bought two cans of Annie Sloan chalk paint and stowed them carefully in the boot of the car. It was time to paint some more stuff grey! Returning home we had a fruitless exercise in trying to get the internet up and running again. We have been without wifi for over two weeks now and the frustration is certainly starting to show. We’ll have to try another tactic as waiting patiently isn’t working well. 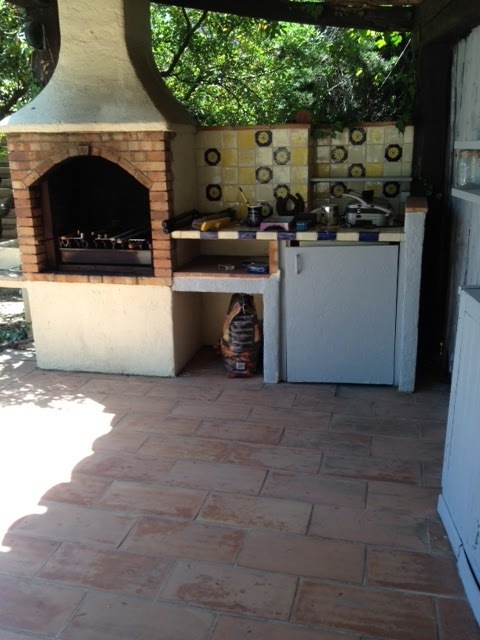 And so in order to salvage the remains of the day, I painted the rest of the outdoor kitchen grey. We had found tile paint in one of the hardware stores and rather than retile the existing and very dated blue and yellow flowers, we decided to have a go at painting over them. The end result was great. For a small investment we now have grey tiles with a slightly embossed flower pattern. 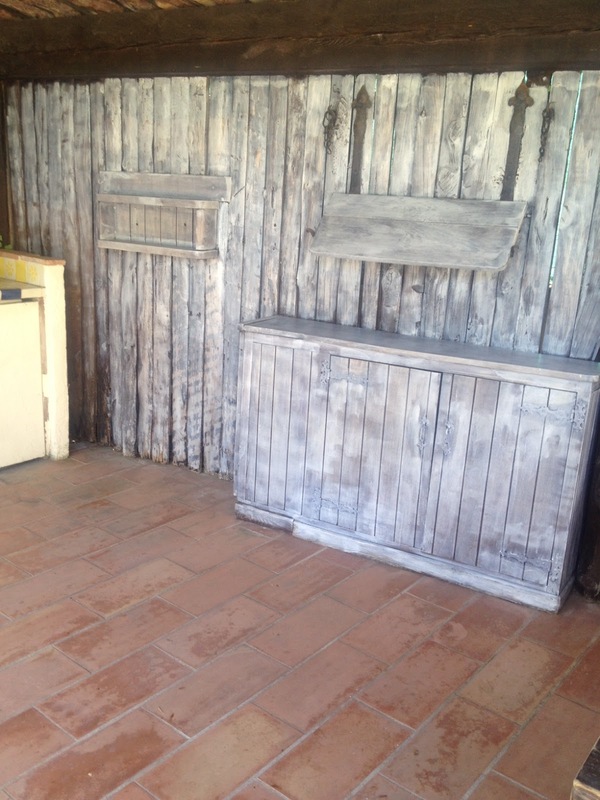 The rest of the plaster was painted from butter yellow to cool grey and started to feel much more integrated with the rest of the cabana. 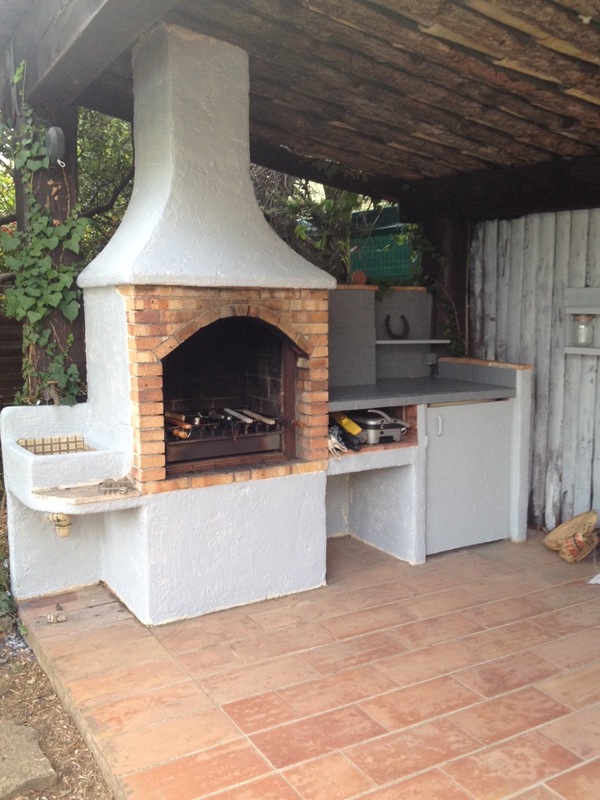 It’s still very rustic but perhaps slightly less than before. Of course I have to do a second coat, not my favourite thing as I’m all about instant gratification but I’m sure it will be worth it. Another relaxing holiday in the South of France! If in doubt, paint it grey. 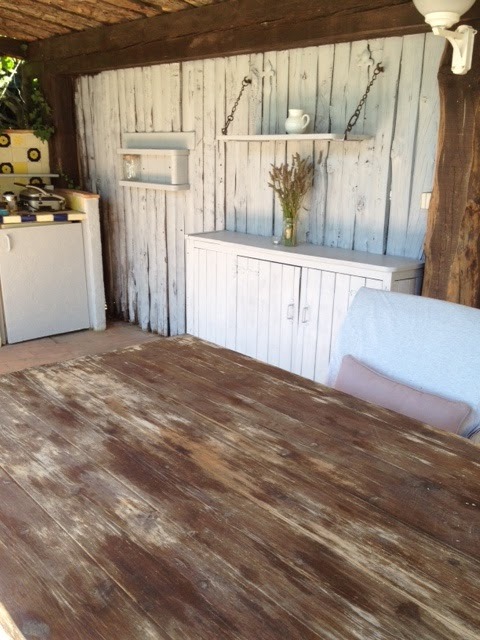 I spent the morning painting the cabana (name of choice for the time being) grey. 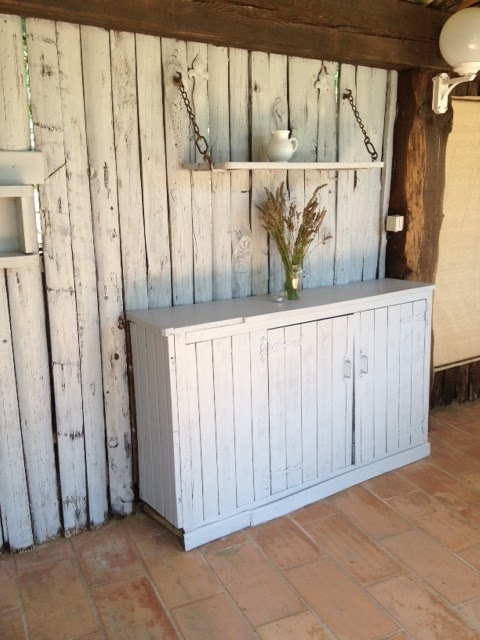 It’s a rustic structure, rough timbers which I’d sanded and undercoated and then, as with many of our projects, painted it grey. 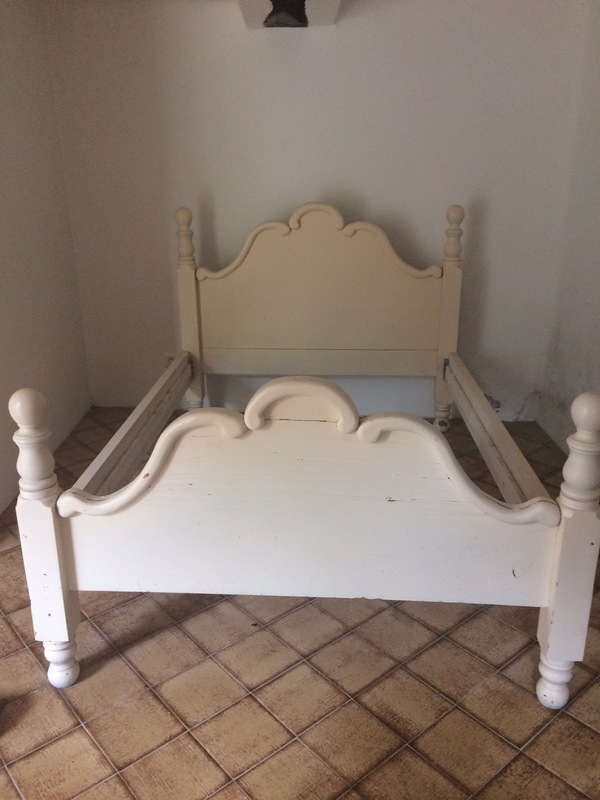 I ran out of paint very quickly (perhaps I was a little heavy-handed) and unfortunately only caught a glimpse of how the kitchen would look but with a little premature staging, it seemed like it would look much improved from the dark brown creosote of before. I’ve dug my grave with this one as there’s a second wall still to do! As I’m back in France, this time for two weeks, it seems I have a few projects to tackle while I’m here. I’m waiting to do a deal in a car park to buy chalk paint (more to come on that,) so it was a good time to slap a bit of paint on the brown walls of the cabana in order to lighten things up a bit. 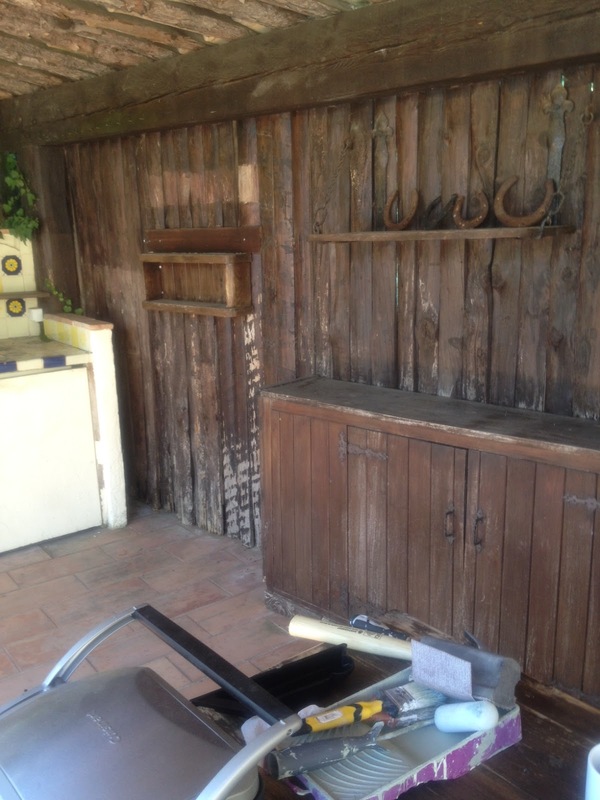 Stage One of Project Cabana was to sand the rustic wooden walls and undercoat. Rather than spend a lot of money replacing the walls and updating the kitchen, we’re trying to update with paint. The undercoat looked rather rustic but certainly started to brighten things up. The next decision is what colour to paint it. I am now a notorious International Homewares Mule. This consists of carrying essential items like dog food, cushions and curtains in my luggage between London and Nice. While it’s not at the same level as drug smuggling, I am notorious in homewares circles. 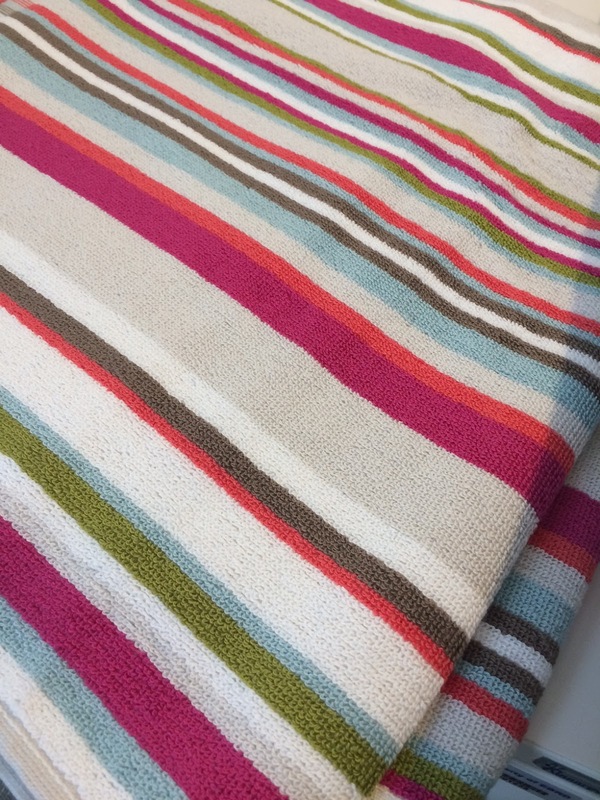 I’ve just taken delivery of some lovely new striped beach towels for use by the pool which will be in my hand luggage this Friday along with coffee pods and room permitting, a tennis racquet. Another weekend, another trip to France. The Friday morning flight to Nice from London City is a joy. Up at 5am and out the door, on the tube at 5:36am, Baker Street to Canning Town then DLR to City Airport, walking through security by 6:45am arriving in time for lunch in France. All in all, pretty smooth. This weekend we had our inaugural guests, my sister and her kids. They had arrived a few days before me, staying with Big T and the Little Dog. I caught up with them for lunch at the nearby Valbonne Friday market where it was Exceedingly Hot. We repaired to the pool as quickly as possible. 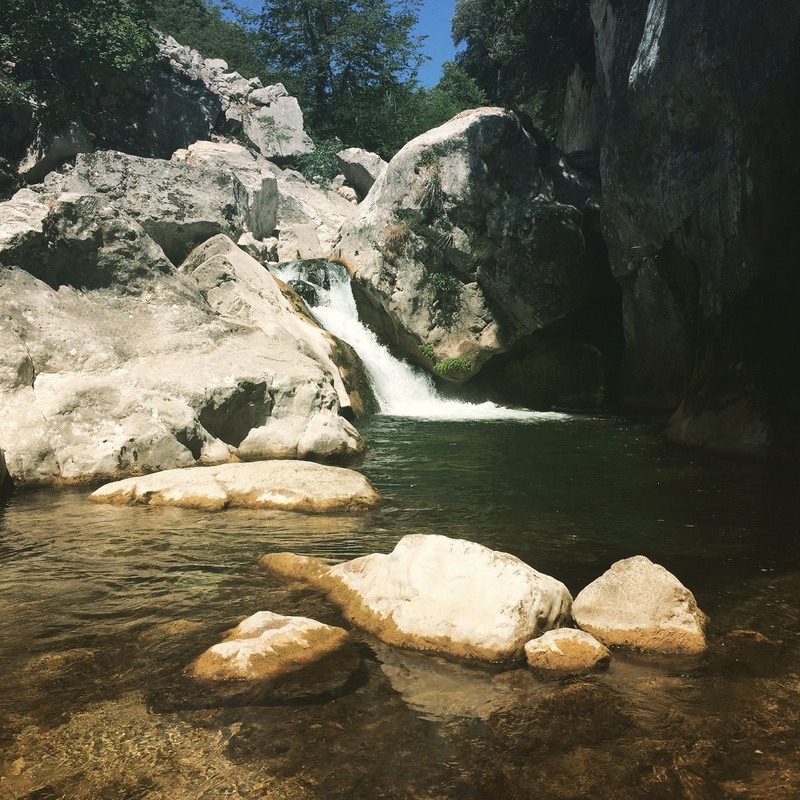 Saturday was spent visiting the nearby Gorge du Loup, a mountain river with waterfalls and swimming holes where we had quite an adventure! We started off walking along a rough track heading towards the sound of rushing water below. It was a hot day and the prospect of cool, refreshing water seemed worth the hike. At the first impasse we soldiered on, teamwork came into play as we passed down bags, dog and guided feet into crevasses on the granite wall. It was a little challenging but on we went. The next impasse was more daunting, a sheer cliff with a knotted rope hanging down marked the way forward. Big T went first, bravely swinging to the ground and then confessing that perhaps climbing back up ropes wasn’t exactly his forte. Good to know beforehand perhaps? He was stuck fifteen feet below us as we watched from above. Disaster! With Big T on the Rocks (a new cocktail?) we decided to abort the mission. Big T set off in search of another way back up the cliff whilst the rest of the group climbed slowly back up the trail. Would we ever see him again?! Suddenly a sharp whistle from above alerted us to the fact that the intrepid explorer had survived and we wouldn’t have to send out a search and rescue party. And, even better, he’d found another way down to the water which didn’t involved swinging on a rope. Hurray! Ten minutes later we splashed our way into an icy freshwater pool under a waterfall. It had all been worth it as we discovered a beautiful grotto complete with moss, ferns and crystal clear water. We swam, ate our picnic lunch and explored the river before the tired group decided it was time to head home for a cup of tea. It had been quite exhausting and there may have been some sore muscles!